With the second edition of The Biographical Dictionary of Scottish Women soon to be published, notable Orkney women were the subject of all six One O’Clock Toasts at the daily lunches of Orkney fare at the Peedie Kirk in this year’s Orkney International Science Festival. And as Jocelyn Rendall pointed out in her toast, the achievement of Christian Robertson were notable indeed. Thank you very much for inviting me to introduce you to one of the many amazing women of Orkney history, Christian Robertson. Christian lived in the late 18th/early 19th centuries but she is one of those characters who could have stepped straight out of Orkneyinga Saga. She’s in the mould of those feisty ladies in the sagas: shrewd, forceful, sometimes ruthless, with tongues sharp as their needles. What did she do? Please imagine yourselves back in Stromness around 1800, not a quiet little town but a hectically busy port, the harbour filled with sailing ships of every kind, wharves and piers and streets crammed with cargoes and merchandise and people, a babel of even more foreign languages than you hear there today. In 1817 the engineer Robert Stevenson came to Stromness and wrote: this tract of coast lies in the direct course not only of the Greenland trade, and Hudsons Bay ships, but of the whole trade from Liverpool, the west of England and Scotland, and North of Ireland, to the Baltic etc, but also to the whole traffic of the kingdom, bound round the northern shores of Scotland. Assisting and profiting from all this commerce were merchant dynasties like the Robertsons, and in 1795 Christian Johnson of Birsay married John Robertson. A huge amount of shipping business flowed through their hands. They organised the freight of Orkney’s exports like kelp and linen, rabbit skins and geese; and her imports: essentials like coal and iron and timber, and the luxuries such as wine and whisky and tea. They supplied provisions to outgoing ships like the whalers which stopped to stock up with men and water and supplies before they headed for the Davis Straits. They arranged insurance Anent Wind Seas and Weather, engaged crews and paid wages and bounties to their dependants in Orkney. But in 1808 John was drowned and Christian was left with four young children to bring up and a business to run. 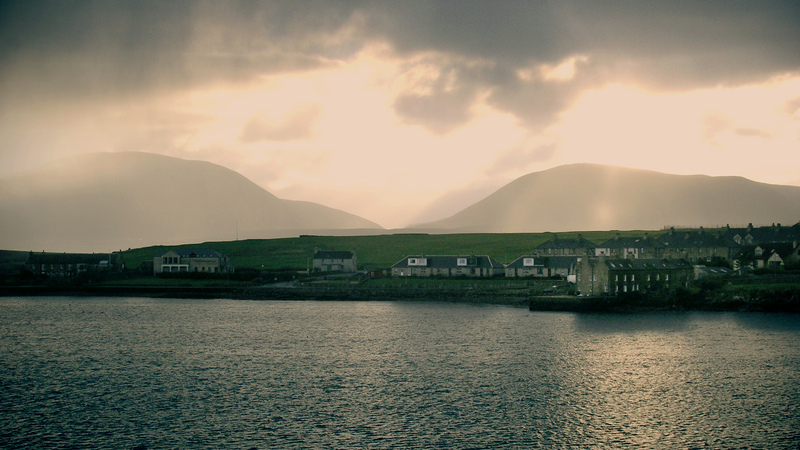 Her situation as single parent and breadwinner was not unusual: so many men left Orkney to find work that there were almost twice as many women as men living in Stromness. It was essential for women to be tough and capable, and Christian was supremely capable. She was not someone to get on the wrong side of, which William Watt, a rather less efficient merchant, did quite often. I am astonished at your behaviour to make fools of us altogether to pretend that you have ordered your kept man to attend your kelp, the Vessel is been down and oblidged to come home again without the Kelp . . . I can assure you that I can not afford to pay men and wadge and maintenance and a heavy Insurance to go dancing after your pleasure. Several other letters to Watt suggest that you tried to mess about with Christian at your peril. But Christian did much more for Stromness than run a successful business. The population was growing but there was a shortage of housing. She built six fine slated double houses on her pier at Ness, her most visible legacy. Stromness was desperately short of schools for its growing population and she opened a school at Ness, Flett’s Academy. There was no bank in Stromness in her time, so every summer Christian had to order cash to be shipped from south so that she could pay the wages and bonuses of whaling crews. She lobbied for a bank, eventually provided in 1835. She raised a subscription for the widows of seven men who drowned in a pilot boat. Perhaps most significantly, it was Christian’s idea to invite Robert Stevenson to Stromness to design and tender for building a dry dock. There was nowhere that ships could be repaired, not just in Stromness but anywhere between the Firths of Clyde and Forth, and Stevenson stressed the urgent need of building one, having witnessed the total loss and destruction of many fine ships, from the mere want of a few days repair in a Dry Dock somewhere at the northern point of Scotland. Christian failed to get a government grant towards a dock (Britain was bankrupt at the end of the Napoleonic wars), and could not afford to build one herself, but it was due to her initiative that in 1836 John Stanger installed the slipway recommended by Stevenson at the Ness shipbuilding yard and the great days of Stromness shipbuilding and repair began. When I first started to research Christian’s life I had a look at Hewison’s invaluable Who Was Who in Orkney. She doesn’t feature, so I wondered how many women did. There are 12 times as many men as women in its pages, and almost half of the women who are mentioned are just a name in the sagas, wife or mother of so-and-so. So I was delighted to find that these science festival lunches are redressing the balance by focusing on some of the significant women in Orkney’s history, and I would like to invite you to join me in raising your glasses to Christian Robertson, Stromness shipping agent and merchant. Jocelyn Rendall came to Papa Westray to join the team excavating the chambered cairn on the Holm of Papay. She stayed to live and work on Holland Farm, home to her husband’s family for 100 years. She has an MA in medieval art from Edinburgh University and worked as curator of the Charles Rennie Mackintosh Collection in Glasgow. She is the author of articles on textile design and on Papay, and the books A Jar of Seed-Corn and Steering the Stone Ships.